Maria Duncan of Shetland at RGU graduations at Aberdeen's Beach Ballroom. A Shetland mum who balanced her studies in Aberdeen with flying to and from home to see her family has celebrated finally securing her degree. 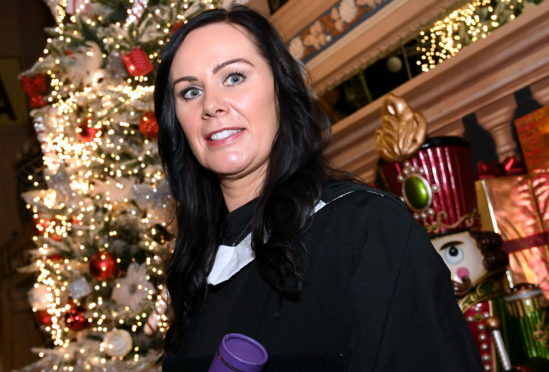 Maria Duncan, 42, collected her BA (Hons) accounting and finance degree after years of using her flights from the isles productively, to cram in extra studying time. Before moving to Aberdeen for her studies, the mother-of-three gained an HNC in accounting over a period of two years attending Shetland College part time, while working as an accounts assistant at the Shetland Times. She said: “I then decided to do the two plus two route, and study my diploma at North East Scotland College, travelling to and from Aberdeen every two to three weeks to attend lectures and using my travelling time on the plane to study. When she was prepared to progress her studies at RGU, Ms Duncan – from Burra in Shetland – moved to Aberdeen with her youngest son. And although she has secured her degree, Ms Duncan is now preparing to take on even more exams as she prepares to move on to the next step in her career in accounting. She added: “This really has been the culmination of a lifelong dream, and it’s finally come true – it’s such a big relief to finally have the bit of paper that proves I could do it.